Philip von Hake at the South Cherry Creek Trail station with his Fuji Wendigo bike. Photo: Loren Hansen. 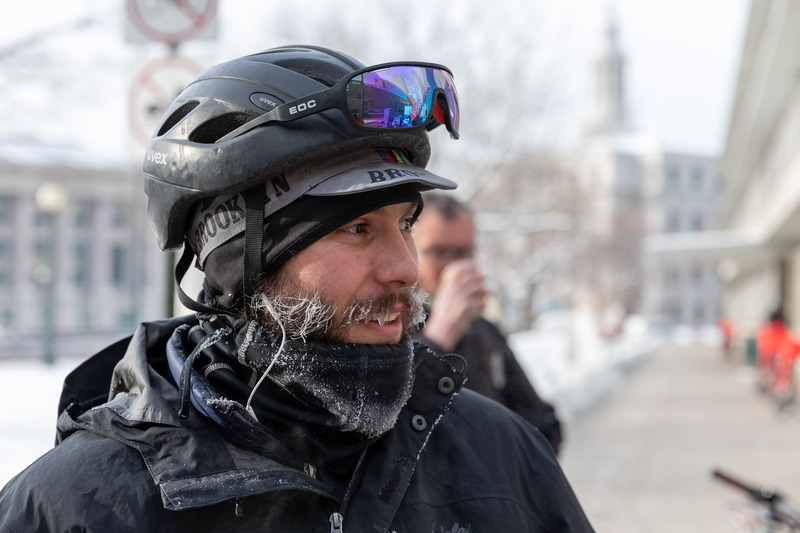 Bewhiskered bicyclists arrived with frost on their beards as they rolled up to Winter Bike to Work Day stations this morning. 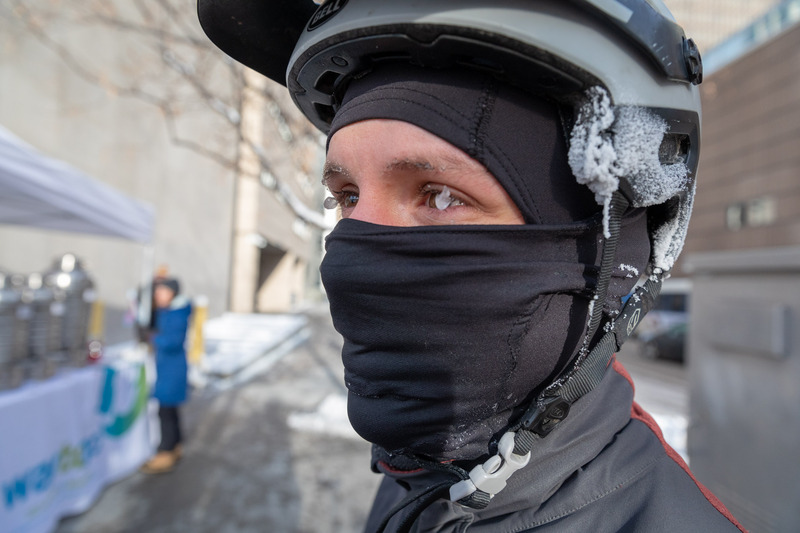 They were among the devout who showed up three days after a storm piled 5.5 inches of snow on the ground and single-digit temperatures left icy conditions on the city’s streets, trails and bike lanes. But before the event, Denver and Boulder led the world in the number of people who committed to trying winter bike commuting this year — and they don’t have to do it today. 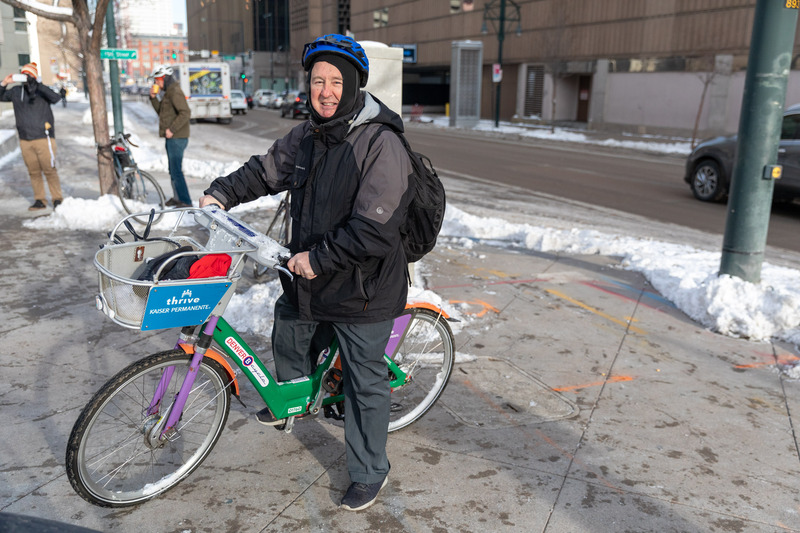 “We actually encouraged people who were not 100 percent comfortable riding today to commit to ride any other day this winter,” says Winna MacLaren, a spokesperson for DRCOG, a regional planning organization and one of the sponsors of the event. Roughly 50 cyclists showed up at the Civic Center bike station, says MacLaren. There volunteers served coffee and burritos. During last year’s ride, when the weather was warmer and drier, three times that number arrived. There were 40 such stations across the Denver region this year. 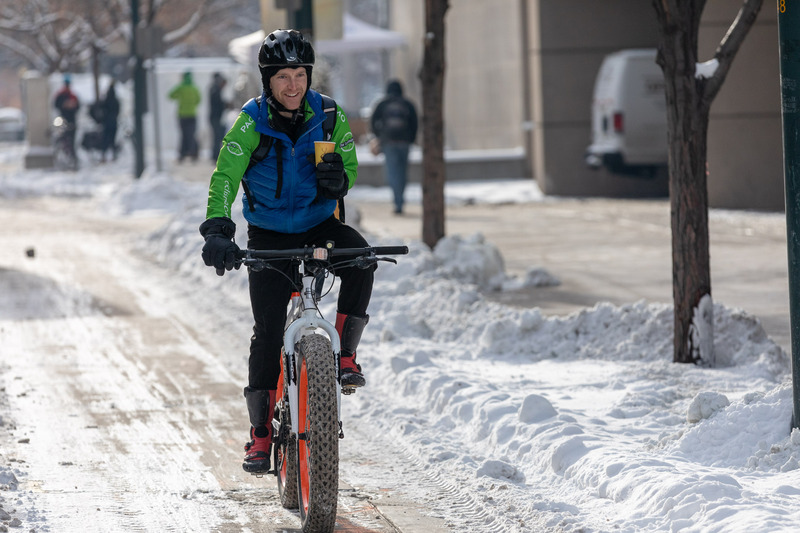 Rolf Eisinger, Denver’s Vision Zero manager, rides a fat-tire bike near the Webb Municipal building. Photo: Andy Bosselman, Streetsblog. Doug Hoffacker takes a bus downtown from Westminster and finishes his trip to work at Channel 4 every day on a B-Cycle bike. “I do it all winter anyway,” he says. “I got some really good long johns for snowboarding. They’re so comfortable I don’t even know they’re on.” Photo: Andy Bosselman, Streetsblog. Icicles formed on the eyelashes of Robert Shime, who rode 20 miles from Englewood and Lakewood to downtown. “I normally come up to downtown to study,” he said. “I might as well grab some coffee and food.” Photo: Andy Bosselman, Streetsblog. Leo Siciliano arrived at Civic Center with an ice-frosted beard. Photo: Andy Bosselman, Streetsblog. 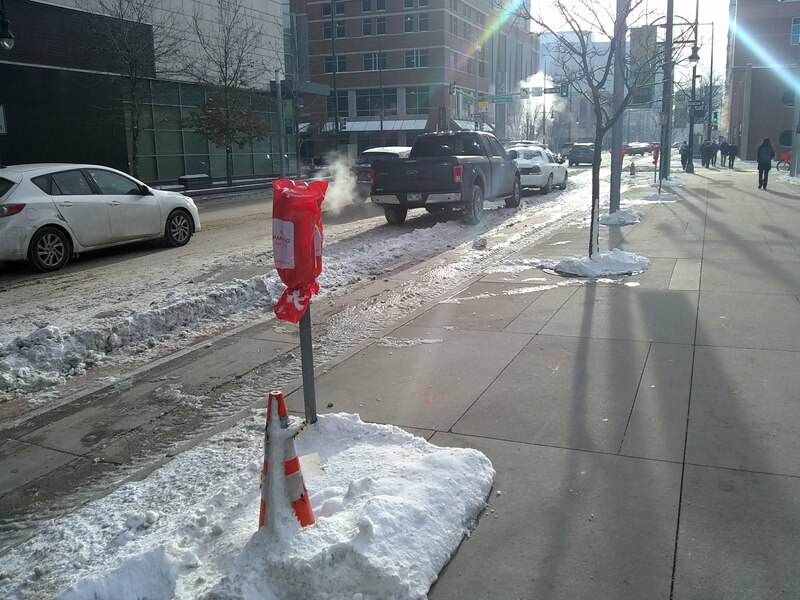 Snow had been plowed from a bike lane near the convention center in lower downtown — but it remained icy. Photo: Loren Hansen, Streetsblog. 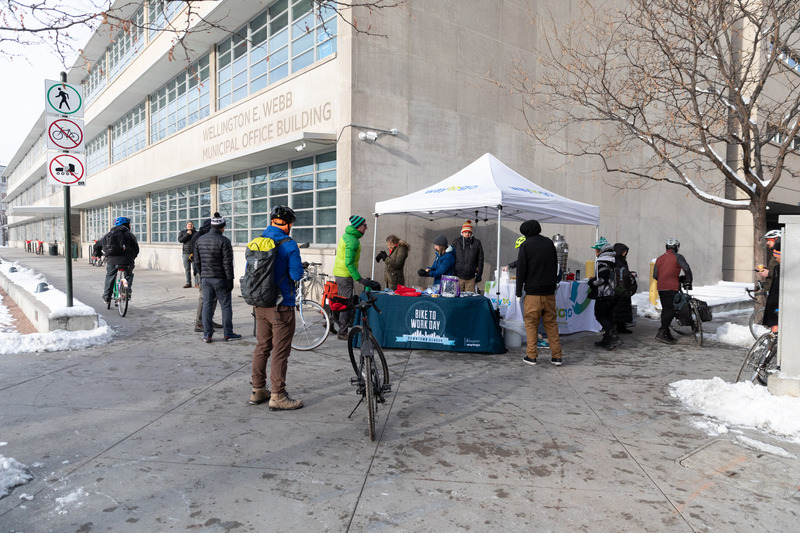 The Winter Bike to Work Day station at the Webb Municipal building in downtown Denver. Photo: Andy Bosselman, Streetsblog.